I, Cormac MacConnell, being either a total fool or a sporting prophet, hereby testify that these lines were written three days and several hours before the All-Ireland football final between Mayo and Dublin, the biggest Irish sporting occasion of the year for the majority of us. As these words were being written the entire nation was convulsed with the kind of anticipation which totally obscured all other issues of the week. If necessary the editor and publisher will confirm that I am telling the truth in relation to the time of filing the story. By the time you are reading this everybody will know the result of the clash and will also, of course, know whether I am a genuine fool or an equally genuine prophet. The hurling final replay between Cork and Clare is still the better part of two weeks away. I bravely put my scrawny neck on the line without fear in order to meet my deadline. THE great GAA sporting finals are upon us again as September wanes and the swallows fly away with our summer. The big games dominate all discussions and debates, and here is one soul who is sick sore and tired of watching and listening to the armies of media pundits on radio and TV and in print sitting on the fence, talking loads of what those horses drop in your Central Park in New York, and refusing totally to forecast the likely winners and losers. It is incredible the way they are all hedging their bets. I’m sick of it, and that is why I’m willingly setting myself up as a cockshot well in advance of the action. I love Gaelic football. I was brought up in a GAA family and society. I played the game with joy at club level for as long as I was able, and I have been fortunate enough to have been in Croke Park for most finals of the past 30 years and more. I know quite a bit about football and its perennial formbook between the counties and provinces. I know less about hurling but believe, with awe, that it is the most thrillingly beautiful ball game of them all, even above Gaelic football. The skill of the top hurlers and their artistry is truly breathtaking. The replay between Clare and Cork on Saturday the 28th is something to be relished by all. 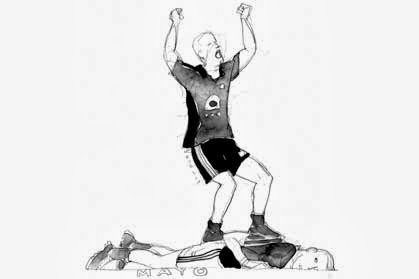 But back to football and the clash between Mayo and Dublin. I will not sit on the fence for a second longer. I predict that Mayo, the best team in the country all season, will NOT win the All Ireland final. I predict that they will follow their dreadful Croke Park pattern in big games over the last 50 years and somehow, once again, will contrive to lose another of the many titles they should have won in my watching lifetime. They will provide Dublin with powerful opposition for three-quarters of the final, will look like the best team afield for long periods of the action, and yet, somehow, in some fashion which I’ve never understood, and the country has never understood, will manage to throw it all away when the French fries are in the pan and the Sam Maguire cup is beckoning. It is heartbreaking to see it happening so predictably September after September. It is awful to see from the stands. God love them. I swear I would rather be a Fermanagh man from a county that never wins anything than a man or woman from Mayo whose team always seems to fall at the last fence. It is a sporting mystery encapsulated within a sporting tragedy. The experts say it will be different this year. The experts always say that. The experts say the current management team has instilled a new resolve into the Mayo team. They always say that also. The experts claim that Mayo have no fear of Dublin and have beaten them already this year. I’ve heard that story so often before. Croke Park. The result until now, though, has always been the same. Oldsters say there is an ancient curse, maybe from the Foxford region, which stands between Mayo and glory. We are back to the Central Park horses here. I would be delighted to be wrong and to be a figure of derision by the time you are reading this. I would love it if Mayo won by even a solitary point and carted the trophy back across the Shannon to the West. But it won’t happen. They will be probably the better team on the day but something always goes wrong for them. A doubtful decision by the referee might gift a penalty to Dublin, for example, or there might be a melee and a sending-off. Or maybe an unfortunate accidental injury to one of their stars in the early defining moments of the game. One way or the other Mayo always finishes up in the sin bin reserved for the losers, and that is very sad. It will be a long winter again below Croagh Patrick beneath which, not so many years ago, in a pub in the foothills, I saw women with rosaries clutched in their hands rather than glasses watching their team lose a semi-final against Cork, again a game they should have won according to the formbook. On the hurling front, after a thrilling All-Ireland final earlier this month which ended level because a Clare defender who had never scored before wrote himself into the sportlore by scoring the equalizing point, the experts are saying that Cork are unlikely to play as badly again as they did in the final, and are likely to clinch the title second time around. I have a gut feeling though that the young Clare hurlers, driven on by their uniquely passionate manager Davy Fitzgerald, are likely to have gained more from the draw and will not alone win what promises to be a thriller but may win going away. If it happens, to quote the old saying, there won’t be a cow milked in Clare for at least a week. Am I a mad fool or a prophet? Time will tell for sure.